The Young African Leaders Effort(YALI) is a signature effort to purchase the next generation of African leaders. The requirement to purchase grooming strong, results-oriented leaders comes out of the data: almost 1 in 3 Africans are in between the ages of 10 and 24, and around 60% of Africa’s overall population is listed below the age of 35.
Who will empower and lead these young Africans? Who will form the future of organisation and entrepreneurship, civic management, and public management? In order to address these concerns, YALI promotes 3 designs created to recognize and empower young leaders: the YALI Mandela Washington Fellowship, YALI Network, and now the facility of Regional Management Centers throughout Africa. The program is open to young African leaders aged 18– 35 years of ages depending upon their level of experience and performance history in their selected sector. 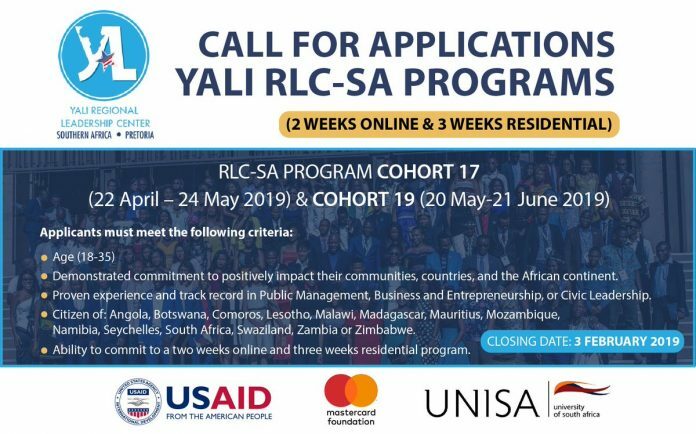 Young leaders from the list below nations are qualified to take part in the program: Angola, Botswana, Comoros, Lesotho, Malawi, Madagascar, Mauritius, Mozambique, Namibia, Seychelles, South Africa, Swaziland, Zambia and Zimbabwe. The RLC SA will mainly be based at the Unisa School of Organisation Management in Midrand, South Africa while the training for the Portuguese speaking individuals will occur at Universidade Eduardo Mondlane in Maputo, Mozambique. The centers at the centre are contemporary. There are 3 lecture halls, cooperation spaces, workplace, common area, lodging and catering centers. The training in Mozambique will occur at the Universidade Eduardo Mondlane in Maputo. There will be lecture halls, cooperation spaces, workplace, common area, lodging and catering centers. Lodging and travel will be offered by RLC SA for effective individuals. A tested record of management in civil service, organisation and entrepreneurship, or civic engagement. They can be brand-new entrants in public and personal service organizations aiming to establish their management capabilities. Tested record of understanding, interest, and expert experience in the sector/track picked. Tested record of active engagement in public or social work, volunteerism, or mentorship. Picked individuals making an application for the contact session need to want to take a trip to the RLC SA in Midrand, Johannesburg or Maputo throughout of the program. A dedication to use management abilities and training to benefit your nation and/or neighborhood after the program. All applications will go through a rigid choice procedure which will be examined by a choice panel. The potential candidates will be talked to pending last choice to the program. Applicants will not be victimized on the basis of race, ethnic background, color, gender, faith, socio-economic status, impairment, sexual preference, or gender identity.